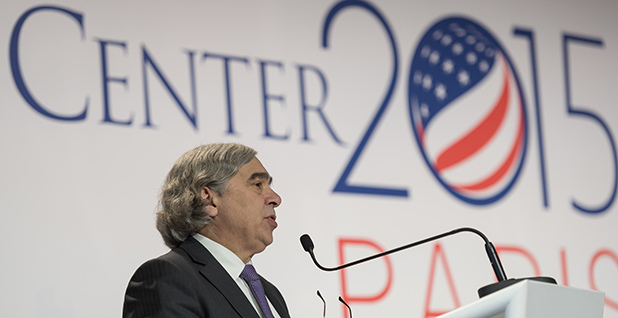 Energy Secretary Ernest Moniz speaks at the U.N. climate change conference in Paris. Photo by Sipa courtesy of AP Images. PARIS — When Energy Secretary Ernest Moniz stepped up to the podium as the Paris climate talks entered their final week, the nuclear physicist did so with the confidence of a seasoned diplomat. "At the risk of — using a Brazilian analogy — being a one-note samba," he said, "innovation is one of the foundations for increased ambition as one re-examines targets in the years ahead." Moniz had been briefed by the U.S. negotiating team. And as the Paris talks rounded a corner, his statement in the press room of the Le Bourget conference center held the samba's three-step, two-quarter rhythm. "Innovation," "ambition" and "targets" had been the thrust of U.S. messaging around a climate deal that ultimately recognized that national pledges to cut carbon emissions were insufficient and could lead to warming beyond 3 degrees Celsius if they weren't boosted well before 2025. Moniz and President Obama's team of envoys hammered home those words during the two-week U.N. summit that ended Saturday with the first global deal to hold countries accountable for cutting greenhouse gas emissions. The talking points were meant to show the United States understood the concerns of island nations, which face extinction if countries refuse to lower their emissions over time. They were meant to speak to India, which needed a clear signal from the U.S. government that it's willing to help the nation transition its expanding coal-heavy economy to zero-carbon sources of electricity. To Moniz, a decadeslong, multitrillion-dollar investment in clean energy technology will be at the heart of any serious effort to stop rising air and ocean temperatures. That dose of reality had to somehow be woven into a Paris agreement that looks out through 2050. In a series of interviews with Moniz, his top deputies and energy experts, EnergyWire reconstructs how U.S. aspirations for a stronger commitment to energy innovation emerged from the dusty shelves of science advisory boards and onto the global stage in Paris. There, Moniz went beyond touting Silicon Valley innovations and the national laboratories to the mobilization of billions of dollars in commitments to help pursue breakthrough technology. For the second time since the Iran nuclear negotiations, Moniz partnered with Secretary of State John Kerry to play a behind-the-scenes but pivotal role in securing a top U.S. foreign policy priority. The White House's stubborn 18-month pursuit of an agreement in Paris dovetailed not only with hard domestic climate politics, but with energy, which Moniz spent 40 years working on at the Massachusetts Institute of Technology. The closer Obama got to Paris, and into the final hours of negotiations, assurances that zero-carbon technology would be available and deployed in China, India and the United States held an ever-expanding seat at the negotiating table. Shortly after arriving in Paris in early December, Moniz sat for a morning interview at a hotel overlooking the Eiffel Tower. Kerry was arriving the next day for the final push to get 195 countries on board with five-year reviews designed to match emissions cuts with advancing energy technology. The day before, Moniz accompanied a group of Democratic U.S. senators to an exhibition hall near the Le Bourget conference, where a 3-D printed car and a model of a nuclear modular reactor were on display. But what Moniz really wanted to talk about was the model of a flying wind turbine at the U.S. ambassador's house in Paris. The original designer, Makani Power, had won a DOE Advanced Research Projects Agency-Energy innovation grant before being acquired by Google Inc.'s innovation arm, Google X. It pulls in wind currents at higher altitudes than conventional turbines and opens the door to zero-carbon energy in areas where low-lying wind is scarce. "This would be a 1,000-foot-high tethered semi-kite, semi-airplane that takes advantage of winds at 1,000 feet," Moniz explained. In November 2010, the President's Council of Advisors on Science and Technology, co-chaired by White House science adviser John Holdren, made a bold recommendation: It's time to untangle U.S. energy policies. The report suggested that Obama order up a Quadrennial Energy Review. It urged a "substantial increase" to $16 billion in annual federal spending on energy research and development, or R&D. If Congress wouldn't bite, the report's authors urged Obama to go to the private sector with the goal of generating an additional $10 billion for R&D. It tied the development of breakthrough energy technology to tackling global warming. "To meet the economic tests that will be crucial for creating large global markets for low-carbon technologies, acceleration across the innovation chain — from science and invention to diffusion — is essential," the report said. In 2010, as an MIT professor, Moniz was part of the 20-member council that authored the report. So was Mario Molina, a top climate scientist, and Eric Schmidt, the former CEO of Google. The panel was keying off the work of others. With little fanfare earlier that year, a group that dubbed itself the American Energy Innovation Council also called on the federal government to invest $16 billion in energy R&D. The who's who of big business were the "principals" behind the report, including Norman Augustine, former CEO of Lockheed Martin, and Chad Holliday, former chairman and CEO of DuPont. And it included a couple of luminaries from Silicon Valley: Microsoft co-founder Bill Gates and venture capitalist John Doerr. Together, they felt the world's largest economies were running out of time to transition the century-old energy systems of the industrialized world to the next century's zero-carbon technology. The effects of global warming were accelerating. Five years later, Moniz saw even greater urgency, said his top deputies, and it was a driver behind a push to build momentum around money for energy technology during the run-up to the Paris meeting this month. In the end, India and other developing countries needed promises of money and technology transfer to sign on to a Paris accord. Still, in real time — in 2015, the hottest year on record — the speed by which smart people make major energy breakthroughs is too slow. "In 30 to 50 years, it's too late. We have to move it faster," said Jonathan Pershing, Moniz's senior climate adviser and a former U.S. climate negotiator. "The whole vision is that you need to ramp up and accelerate that." Slicing into the historically high costs of deploying clean technology before a country like India builds scores of coal-fired power plants — with an estimated 300 million people without electricity — was quickly being crystallized as White House officials pushed toward Paris. "You need more low-cost technologies at scale all over the world, and that's how you get political leaders to be more ambitious over time," said David Turk, DOE's deputy assistant secretary for international climate and technology. Gates had been thinking about energy R&D for much of 2015. In June, he committed $2 billion of his own cash for work on clean energy, but, to his mind, this wasn't supposed to be the pet project of one wealthy person in the developed world. Gates' Rolodex has the names of the richest 1 percent in America, and in August, a big idea started to get legs. In a letter — then in a phone call — Gates asked Moniz to help him move a public-private partnership aimed at coupling billionaire commitments of private investment with pledges from the United States and other governments to double energy R&D funding. The way the Obama administration saw it, this could help sweeten the pot before tough Paris negotiations about the obligations of rich countries to help finance transitions to cleaner energy in the developing world. It would bring on "patient" long-term private investors. That way, the most promising advancements don't run out of money before they can be commercialized. In a three-month surge, Gates rounded up 28 investors to join his Breakthrough Energy Coalition. By late November, it included Gates, Doerr, Facebook co-founder Mark Zuckerberg, investor Vinod Khosla, Virgin Airlines founder Richard Branson, and billionaire gas trader and philanthropist John Arnold. It included rich investors in France and Germany, along with Mukesh Ambani, the chairman of India's Reliance Industries, a fossil fuel-heavy energy conglomerate, and Jack Ma, the chairman of the Chinese retail giant Alibaba Group. In Washington, D.C., Moniz and his staff started working the phones right away. The goal was to get commitments from as many governments as possible to double national R&D funding by 2020. In September, the pace accelerated. Moniz and the White House wanted India on board. Up to that point, Obama had spent most of his political capital on courting China. In November 2014, a landmark U.S.-China agreement spurred the two adversaries to put early pledges on the table for Paris. The United States pledged to cut emissions up to 28 percent below 2005 levels by 2025, and the administration would finalize its Clean Power Plan to cut power sector emissions. China pledged to peak its emissions before 2030. In a U.S. visit in September, President Xi Jinping said China would establish the world's largest carbon trading market. In a flurry of activity to establish closer ties with India ahead of Paris, Moniz and Obama's senior White House energy and climate adviser, Brian Deese, shuttled among D.C., New Delhi and California. Moniz took a Sunday flight to San Francisco in late September for a half-hour meeting with India Prime Minister Narendra Modi, who was there pitching India to Silicon Valley, rubbing elbows with solar industry executives and touring Tesla Motors Inc.'s electric car factory in Fremont, Calif.
With giant clean energy ambitions but an economy that craves subsidized coal and oil, Modi was the linchpin for the public-private partnership initiated by Gates — and to a deal in Paris. "This issue of managing growth as we still address climate change, both mitigation and adaptation risks, means India is a central player," Moniz said. "There were lots of reasons why bringing India in was viewed with our French hosts as an essential threshold to have this move forward," Moniz said of Gates' plan. "This was not to be a developed nations initiative." When Modi took office in the spring of 2014, he proposed a 100-gigawatt goal for solar power but also promised to expand the electricity grid, even if it meant erecting massive coal stations. When Moniz went to visit Modi, India was a holdout in the Paris process. It had not yet submitted a pledge for emissions reductions — its INDC, or, in U.N. speak, its "intended nationally determined contributions." During a 36-hour period at the end of September, culminating at the United Nations General Assembly meeting in New York, Moniz, Obama, Gates and French President François Hollande made what they hoped would be the final pitch to Modi. Everyone felt it could move the ball in Paris, with Gates enumerating the potential scale of reliable, longer-term private capital in the many billions of dollars, and with heads of state, including Obama, putting skin in the game. Gates, his investors and the Obama administration kept quiet as investors and countries signed on. Gates used his powerful bully pulpit to set the stage in a November article in The Atlantic. The "conservative market" for financing energy innovation wasn't working, he said. If the U.S. government could double to $12 billion its energy R&D, that's great. "But I would love to see a tripling, to $18 billion a year from the U.S. government to fund basic research alone," Gates wrote. In the end, the United States and 19 other countries agreed to double R&D spending. Modi suggested they call the public pledge Mission Innovation, and it stuck. On Nov. 30, Obama, Gates, Modi and Hollande stood on the stage together to roll out the public-private partnership. Moniz had just been in the French capital a few weeks before to chair the ministerial of the International Energy Agency. There, he pushed this institution of major oil-consuming countries to send a statement to the U.N. climate conference. "The statement emphasizes the close relationship between energy and climate change," Moniz wrote in his summary of the meeting, "and it highlights the need to promote policies and innovation that can facilitate a global transition to a clean energy economy." Moniz returned to Paris a few weeks later to grease the innovation theme during the climate talks. "This wouldn't have happened if it weren't for Moniz," said a source close to Gates. Richard Kauffman, New York's energy czar, applauded the emphasis on funding innovation. But he also sounded a note of caution: The United States needs to get bolder about deployment. "The solar industry today got to where it is not because of whiz-bang new technology," Kauffman said. "It's been because of the tremendous benefits of scale. That's why costs are lowered. It was other countries that decided to deploy things into markets, not us. "It's not only about markets," he added, "but if we just focus on innovation, we're not going to get it right." Kauffman is leading what many consider to be the nation's most ambitious electricity market reforms. With an onslaught of executives in Paris, including Tesla CEO Elon Musk and the chief executives of U.S. solar giants SolarCity Corp. and SunPower Corp., Kerry and his team banged away at Moniz's theme: U.S. technology companies would sell solar panels, batteries, electric cars and other advanced technology around the world. After the French foreign minister banged his gavel and sealed the deal Saturday, Kerry in a speech in the cavernous plenary in Le Bourget pointed to "the genius of the American spirit." "That will create new, greater research and development, and the next great product will come that will change our lives," he said. The technology piece of the 30-page agreement doesn't spell out the use of technology or require technology giveaways from rich countries to poor countries. But it's designed to build off existing partnerships. The United States, China and India all have bilateral programs. Building "robustness" into the technology investment cycle was critical, said Jennifer Morgan of the World Resources Institute. "There are many ideas that are already out there," said Bob Perciasepe, president of the Center for Climate and Energy Solutions. "The question is getting it to scale. It's not always dreaming up new things. How do we get the ideas we know are good on paper or in the lab to be commercialized?" Perciasepe, the former deputy administrator of the U.S. EPA, said the combination of domestic policies and big global investment is a critical realignment of the U.N. charter around climate change. You have to "drive the hybrid model with all the things that make it happen, whether it's government, business or philanthropy," he said.